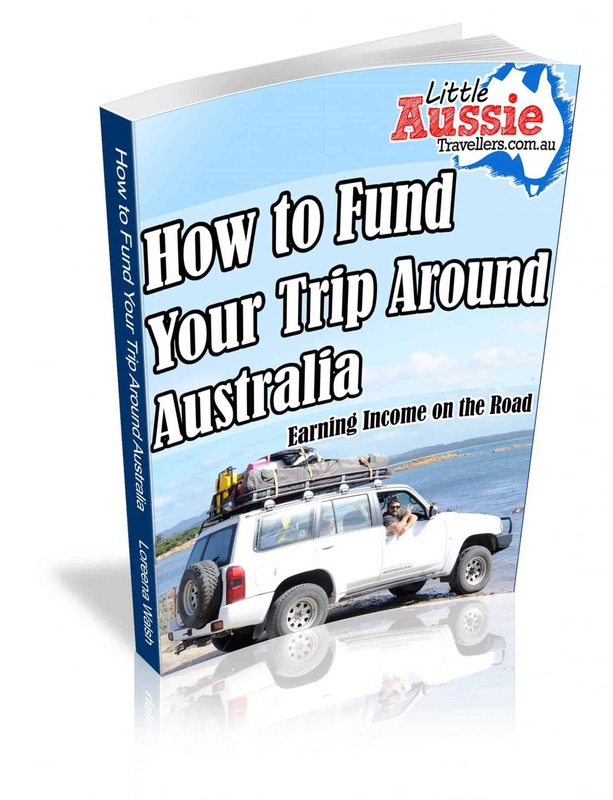 If you’ve been following our hunt for the best family activities in Sydney, you’ll know we had a great time exploring Sydney things to do with kids, and experience things we’d never had the chance to do before. 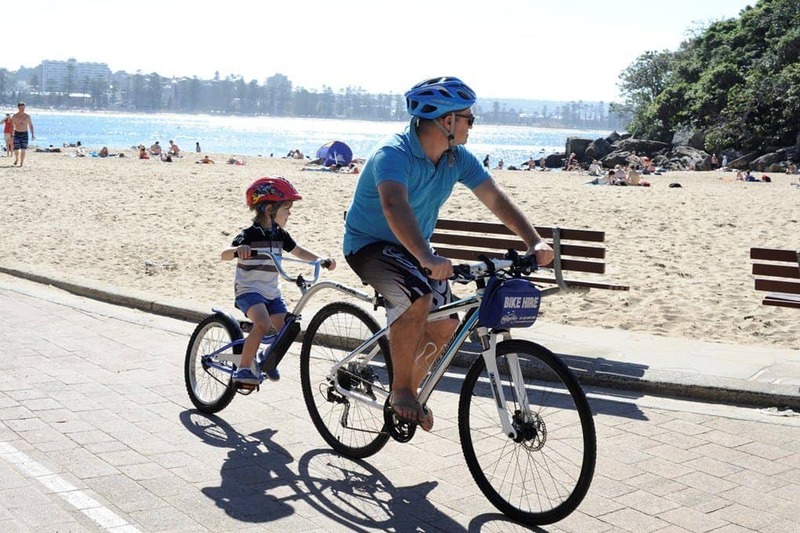 Something we hadn’t considered doing before was bike riding in Sydney with kids. 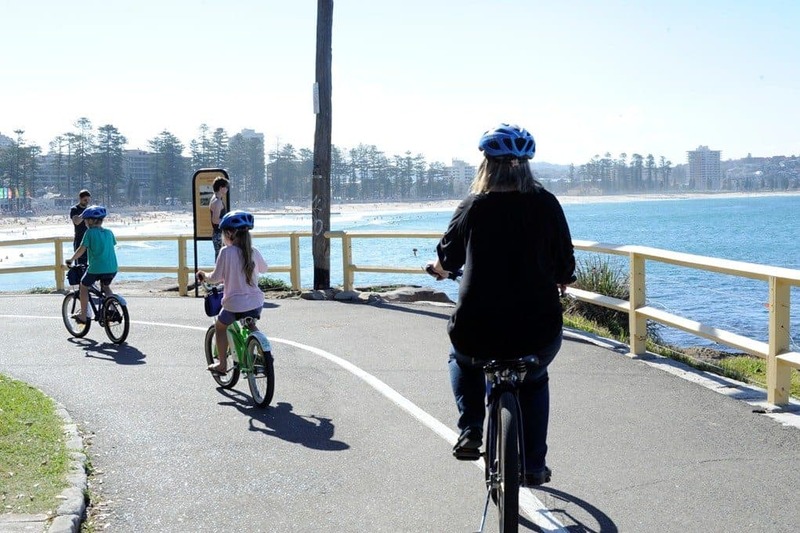 We were really excited to visit the awesome people at Manly Bike Tours who provided us with the perfect bike setup, so every family member could have a great time. I’ll be truthful, I don’t think I’d really ridden a bike since school and I felt pretty wobbly when we started out. Matt and the kids were really confident, and Byron was tucked nicely behind Matt’s bike on a tag-along bike so that he could enjoy the ride, but not get too tired or have an accident. He enjoyed being on the tag-along, but something tells me he would have been a better rider than his poor mum :). Anyway, wobbles were soon forgotten and we headed off along the Manly Esplanade, and WOW! It was gorgeous! I soon forgot that it had been years since I’d enjoyed the freedom of bike riding and started to navigate my way amongst the walkers, joggers, couples and children scattered along the esplanade enjoying the warm, sunny afternoon. I was really surprised at how relaxing the experience was, and to be honest got totally disappointed when the couple of hours we’d allocated to spending here was coming to an end. We chose to stick to the Esplanade, which is a safer option with the kids, rather than navigating streets and crossings. 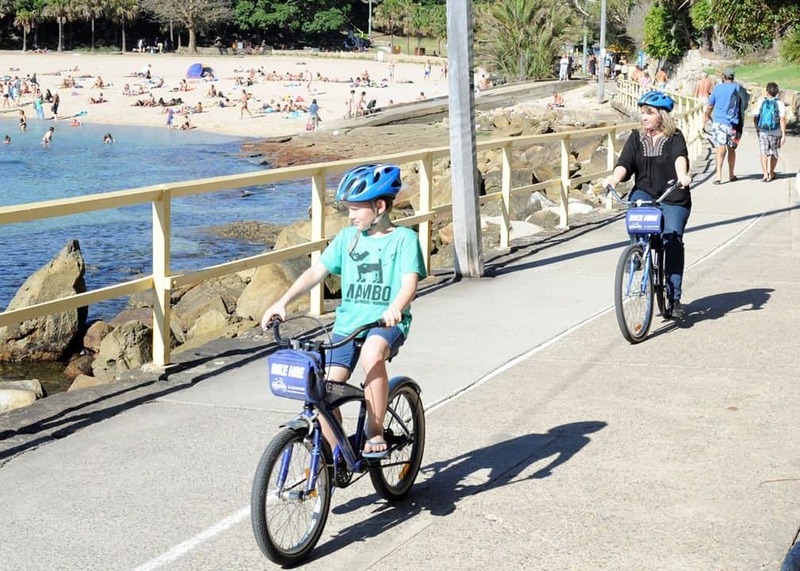 When you pick your bike up from Manly Bike Tours, it’s a short walk through the corso over to the esplanade. It’s important to note that you need to walk your bikes through the corso as no bikes are allowed to be ridden in there. Helmets are provided, and you can see by our photos that little carry packs are located on the front of the bikes that allow you to carry items such as your mobile phone etc. Our bikes were provided by Manly Bike Tours. They offer a huge range of bikes for adults and kids including tag-alongs and bike trailers for littlies. The team provide maps and will give you a run down on where is the best track to take based on how challenging you’d like your ride to be and the ages of your kids. 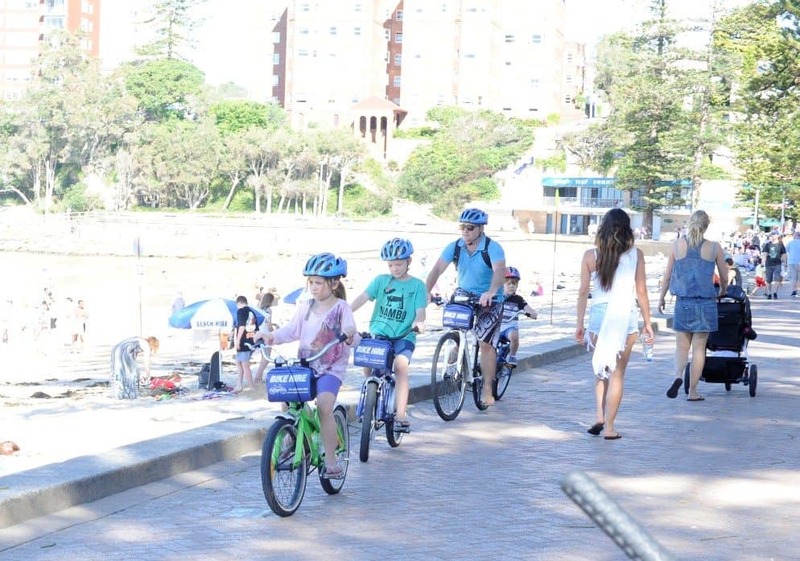 While this wasn’t something I’d considered doing before, hiring a bike and exploring Manly was a really special way to experience the Manly Esplanade, and show the kids another side to Sydney. I totally fell in love with Manly while we were there, as it had been years since we’d visited. We stayed there the night and enjoyed an evening wander through the corso, had dinner down on the wharf and despite being exhausted by a morning at Taronga Zoo, we took the time to soak up the warm, salt filled evening, and finished up with a treat of Ben and Jerry’s Ice cream when we wandered home to our hotel and then relaxed in the spa!